This contemporary style 3-drawer chest features simple lines that will fit right into any decor. It offers closed storage to serve your needs and rounded corners for safety. Complete assembly required by 2 adults. Tools you will need (not included): Hammer and screwdriver. 5-year limited warranty. Any product-related questions? Contact South Shores customer service, available 7/7: 1 800 290-0465, or visit www.southshore.ca. This practical 4-Drawer Chest is both stylish and perfectly suited to everyday storage needs and goes really well with the look you've always wanted for your little sweetie's room. We designed it for moms-to-be who would like soothing pastel tones in a nice calm setting, or a lot of colour with a touch of fantasy. Only your imagination is holding you back! If your little princess dreams of her Prince Charming, ask her what she thinks of this collection! Our moms just love its simple, girly style. Add your daughter's favourite colours to create a fairy tale dicor! This 5-drawer chest is both trendy and functional making it well suited to everyday needs and perfect for your little princess's room. It features chic crystal like knobs and a decorative kick plate highlighting its feminine country style. With its contemporary look, this 5-drawer chest from the Lazer collection will offer you several practical storage spaces, for an orderly room. Its charcoal finish top, straight lines and elegant metal handles and legs will make your child's bedroom stylish, for a unique and modern design. With its country style, this chest is sure to add a touch of color to your daughter's room. Its unique qualities give this collection an undeniable romantic charm. You'll love its rich finish and practical storage. This item comes with a 5- year quality guarantee. Can be combined with items of this collection. Libra Collection 3-Drawer Chest Pure White This contemporary style 3-drawer chest features simple lines that will fit right into any decor. It offers closed storage to serve your needs and rounded corners for safety. 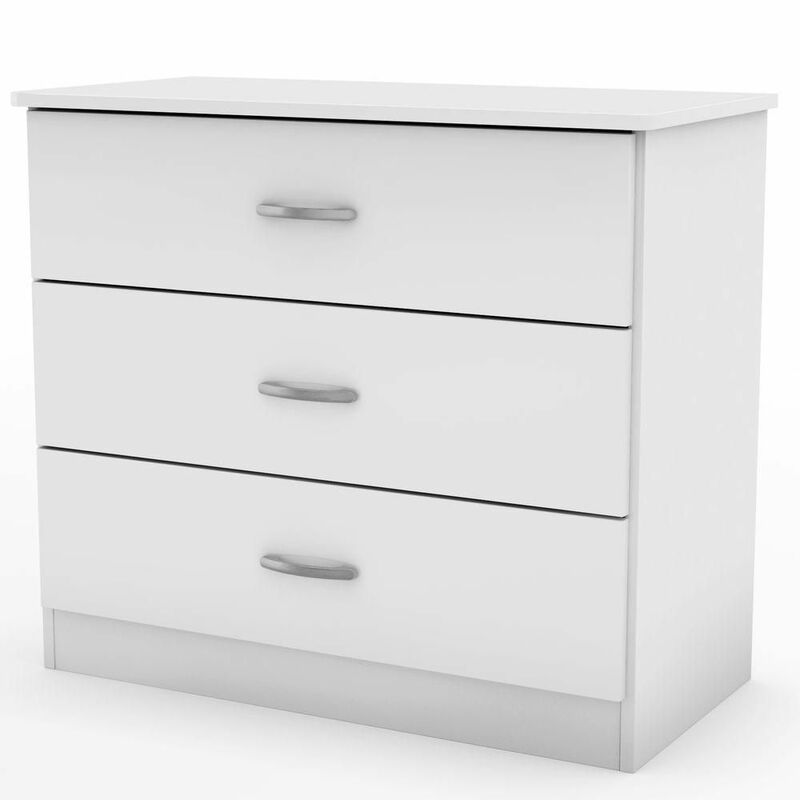 Libra Collection 3-Drawer Chest Pure White is rated 3.6 out of 5 by 38. Rated 3 out of 5 by Anonymous from good value for product Not hard to assemble. Holes drilled wrong on one drawer but my husband is handy and it was a quick fix. Rated 1 out of 5 by Homemaker from No reorder This is absolutely the worst piece of ready to assemble furniture I have ever purchased. I will never again order this brand. The directions were sketchy & even totally wrong in one place. The corners did not fit tight & some of the fasteners were almost impossible to work. Rated 4 out of 5 by Anonymous from Good for the price I bought 4, 3-drawer chests for my sewing room to hold thread, rulers, etc. The quality is what you would expect for the price. I wouldn't recommend putting anything in or on top that was too heavy, but it works just fine for my needs. Easy to assemble. Rated 4 out of 5 by organized from 3 drawer review Great for extra storage in my closet so I ordered another one. Easy to put together (helps if a 2nd person is available). Seems sturdy. The 1st one was purchased approximately 6 months ago and is still staying strong. Rated 4 out of 5 by Buckles from Looks nice and works well This was pretty easy to assemble. There were 2 holes that needed a little bit of wood glue to hold the drawer together, but I think that's not too uncommon with furniture you assemble yourself. Otherwise, looks great and works well!